Solve EMI and RFI problems with our ME Series EMI-shielded connector hoods. Protect your aircraft wiring and associated systems. Electromagnetic interference (EMI) and radio frequency interference (RFI) can create degraded—and sometimes erroneous—operation of aircraft systems; this is especially true of digital systems commonly found in modern aircraft. 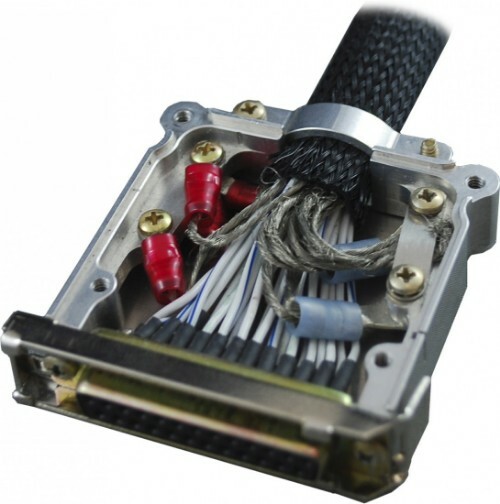 Proper selection and use of shielded wires and cables in the aircraft offer protection from EMI and RFI, but only if the shields are properly terminated. AEM can help solve these problems with our ME Series EMI-shielded connector hoods. Connector options are available from 15-62 pins. See our product brochure for the full list of mechanical specifications. If you have a capability requirement that isn’t met by an existing system, AEM is open to new opportunities that meet the demands of both fixed- and rotary-wing aircraft. We work with pilots, integrators, and OEMs to deliver solutions for today’s avionics market. Tell us what you need.